Take advantage of the Code First data modeling approach in ADO.NET Entity Framework, and learn how to build and configure a model based on existing classes in your business domain. With this concise book, you&#8217;ll work hands-on with examples to learn how Code First can create an in-memory model and database by default, and how you can exert more control over the model through further configuration. 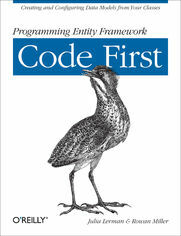 Code First provides an alternative to the database first and model first approaches to the Entity Data Model. Learn the benefits of defining your model with code, whether you&#8217;re working with an existing database or building one from scratch. If you work with Visual Studio and understand database management basics, this book is for you. This book is a continuation of author Julia Lerman&#8217;s Programming Entity Framework, widely recognized as the leading book on the topic.